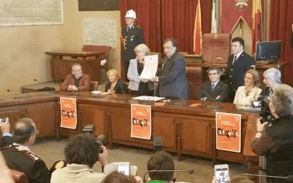 The German filmmaker Margarethe Von Trotta was appointed honorary citizen of Palermo by the Mayor Leoluca Orlando, which is very proud of the new citizen. Margareth Von Trotta was moved by this appointment, saying it’s it’s a great fulfillment in her career. To Margarethe von Trotta, which is engaged in narrations of the female point of views, was dedicated the retrospective ‘Le donne di Margarethe’ organized by the association Più donne più Palermo, leaded by Mrs Pina Mandolfo, e by The Goethe Institut, headed by Mrs Heidi Sciacchitano.